This manual is outdated. A more up-to-date version can be found here. between independently accessible windows within the same terminal instance that can be tracked with tabs on the bottom of the terminal (here eight window tabs). In this manual all commands are given in code boxes, where the commands are printed in black and the comment text in blue starting with the standard comment sign '#'. Commands starting with a '$' sign need to be executed from the Unix/Linux command prompt and those starting with '>' from the R console. Commands starting with a colon ':' or 'Ctrl-a :' refer to the vim command or tmux command modes, respectively. Terminal application: e.g. xterm under Linux, iTerm under OS X, Putty under Windows, etc. (1) Install a current version of vim (version 7.3 or higher). Most Unix/Linux operating systems come with vim pre-installed. (2) Install a recent version of the R software. Download the following sample .tmux.conf file to the highest level of your home directory. Before this is done, it is recommended to make a backup copy of any existing .tmux.conf file. Copy the section "sample settings for vim-r-plugin" from this sample .vimrc file to any existing .vimrc file. If there is none then one can download the entire sample.vimrc file to the highest level of a user's home directory. To open R automatically in a terminal rather than the R Gui, OS X users want to uncomment/include the following two lines in their .vimrc file. This step should be skipped on Linux/Unix systems. This archive contains all of the above components and configuration files needed to make things work on UCR's biocluster system. 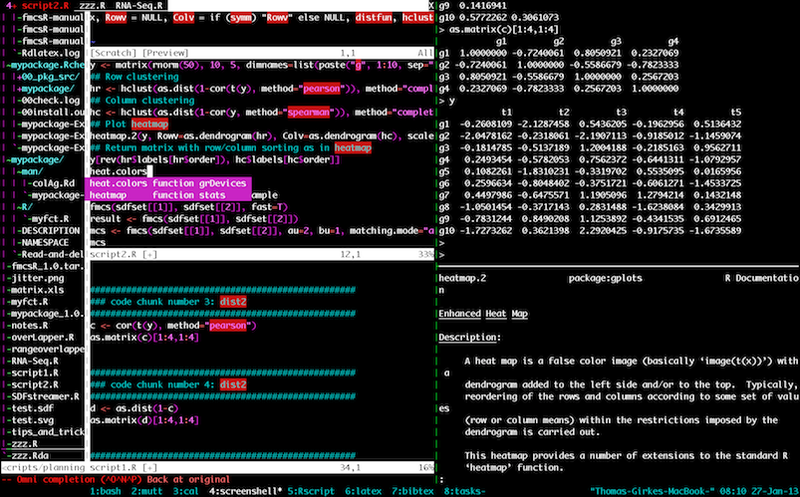 A newer version with support for *.Rmd files and color highlighting in R console is here. This will open a tmux session with a single window. After this a tmux custom session can be loaded with with "Ctrl-a r". The one provided with the above ".tmux.conf" sample file contains 6 windows with tabs at the bottom. They are defined in the section "sample session initialization" of the .tmux.conf file. Users want to edit this configuration according to their personal preferences. This will open an R session in a separate tmux pane. Closing vim will also close the R pane. Note, in the provided .tmux.conf file the command key binding has been reassigned from tmux's default 'Ctrl-b' to 'Ctrl-a', and the shortcut for starting R has be reassigned from '\rf' to 'F2' in the .vimrc file. The command key binding 'Ctrl-a' is the most important key sequence in order to move around in tmux. For instance, the key sequence 'Ctrl-a o' will switch between the vim and R panes, and 'Ctrl-a Ctrl-o' will swap the two panes. To send several lines at once, one can select them in vim's visual mode and then hit the space bar. Please note, the default command for sending code lines in the vim-r-plugin is '\l'. This key binding has been remapped in the provided .vimrc file to the space bar. Most other key bindings (shortcuts) still start with the '\' as LocalLeader, e.g. '\rh' opens the help for a function/object where the curser is located in vim. More details on this are given below. # command prompt after quitting the R session in the connected pane. Google search for "vim manuals"
Note: many tmux commands can be executed from both the Unix/Linux command prompt or the tmux command mode indicated below with '$' or ':', respectively. The latter can be accessed with the key sequence 'Ctrl-a :' and then typing the same commands as on the command prompt without the 'tmux' prefix. Also, the following uses 'Ctrl-a' as tmux's command key binding. Users who are not using the above .tmux.conf file may need to use here tmux's default key binding 'Ctrl-b' instead. Ctrl-a : kill-session # kills tmux session; tmux server can be killed with "Ctrl-a : K"
NERDTree is a vim plugin that adds file browsing functionality in visual tree mode to vim. It also provides very useful features to quickly switch between files (e.g. within tmux panes), which is particularly helpful when working with many files. :let ScreenShellTmuxPane = "%1" # reassign vim pane session variable (here "%1"), should be the same as output of "Sys.getenv("TMUX_PANE")"
> Sys.setenv(TMUX_PANE="%1") # reassign R session variable (here "%1"), should be the same as output of "let ScreenShellTmuxPane = "%1"
If there are problems with the DISPLAY settings, follow these instructions that fixes the problem by running "tmux update-environment".